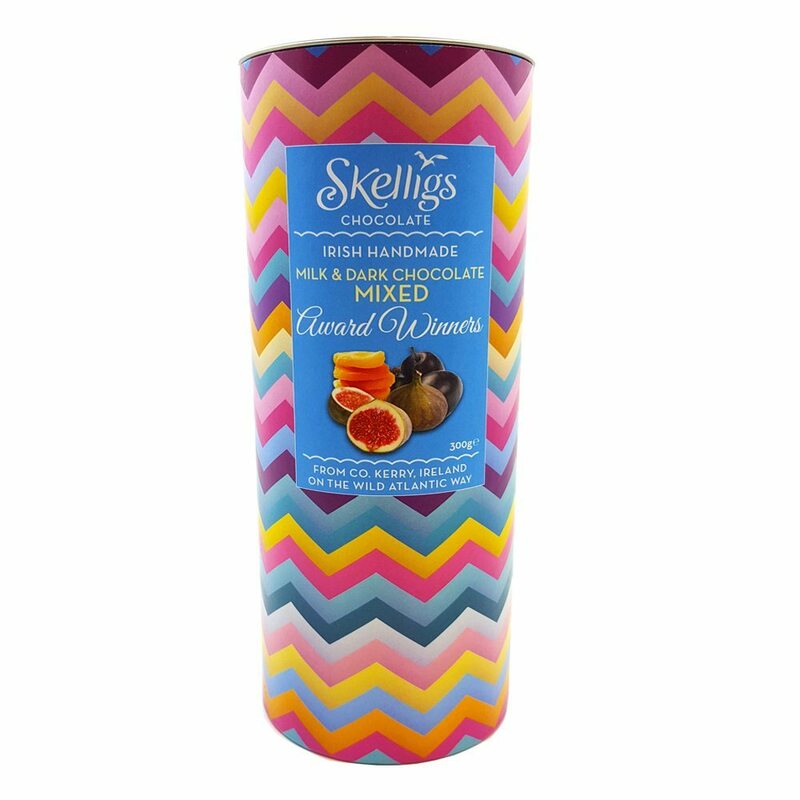 New to the Skelligs Chocolate range, our assorted Award Winners are the perfect gift this Christmas!! 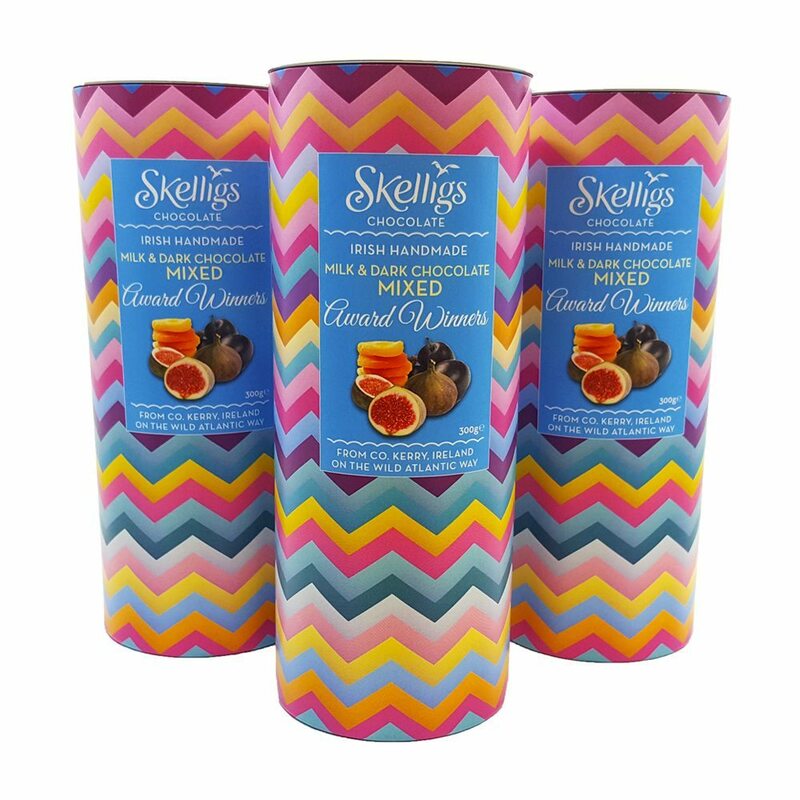 The tube contains a 300g selection of mouth watering Brandy Plums, Apricot Amarettos and Fig & Rum. Made by hand in our factory. Each Tube contains 300g of chocolates. 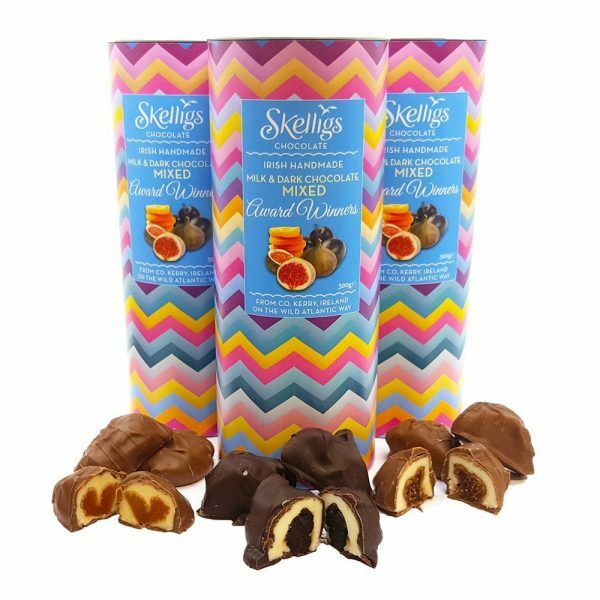 If you don’t start nibbling they will last 5 months. Sundried apricots 55%, Milk chocolate 20% [sugar 42%, cocoa butter 24%, whole milk powder 22.5%, cocoa mass 11.5%, emulsifier: soya leicithin, natural vanilla flavouring] White chocolate compound 20% [vegetable fat (palm, sunflower,rapeseed) 40%, sugar 35.5%, skimmed milk powder 13%, milk sugar 10.5%, emulsifier: soya lecithin] Amaretto 4.8%, sulphur dioxide 0.2%. Min. 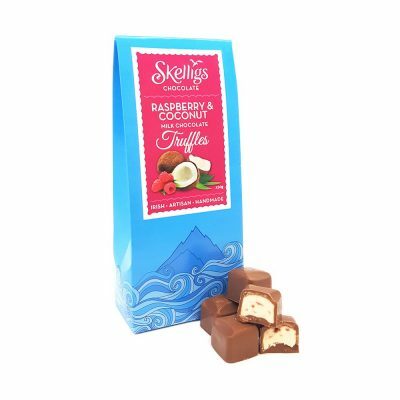 cocoa solids: 33%. Contains vegetable fat in addition to cocoa butter. 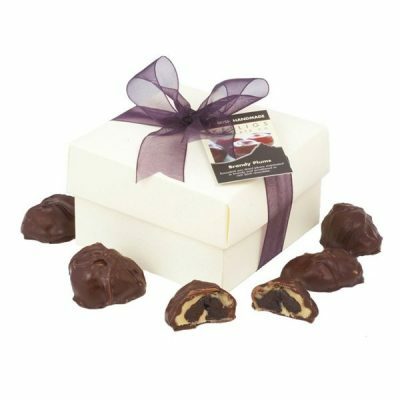 Sundried figs 60%, Milk Chocolate 20% [Sugar 42%, Cocoa butter 24%, Whole milk powder 22.5%, Cocoa mass 11.5%, Emulsifier: Soya lecithin, Natural vanilla flavouring], White chocolate compound 19%, [Vegetable fat (palm, sunflower, rapeseed) 40%, Sugar 35.5%, Skimmed milk powder 13%, Milk sugar 10.5%, Emulsifier: Soya lecithin], Jamaican rum.